By the time you are looking at this post I will be up in the “barrier of spears” , the Drakensberg mountain range in South Africa. Hopefully I will be able to bring back some interesting landscapes and images of Bearded vultures and a variety of other birds from the “vulture’s hide” at Giant’s Castle. As a wildlife photographer, I am very interested in the essence of things. The artistic essence – form, shape and pattern – helps you to focus on composition. When you take away colour from an image you are left with contents; strong colours draw your attention to certain elements in the image. 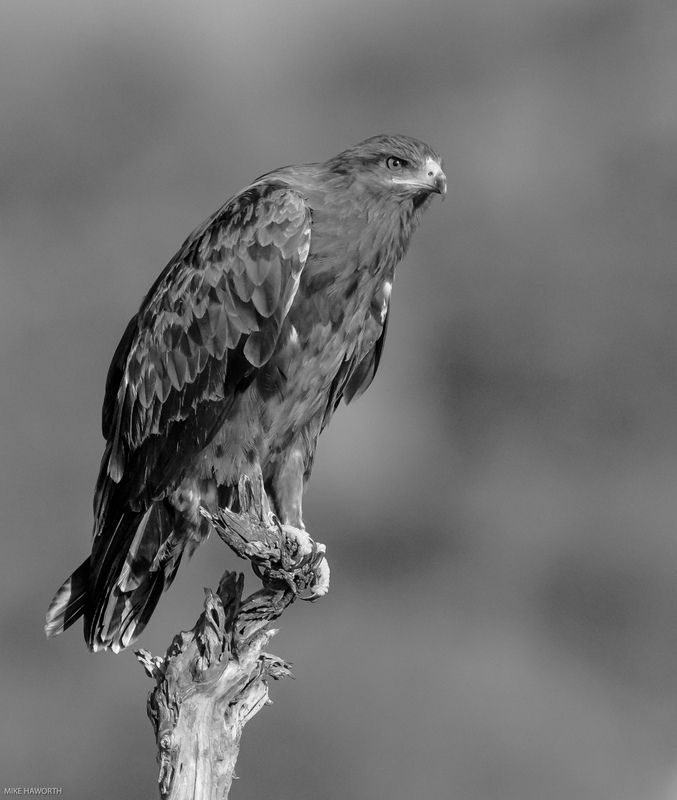 Black and white images create mood, atmosphere and feelings, and so the light illuminates and shadows define. I was particularly intrigued by this image. It was taken in the morning with the sun behind me. The moon was sinking towards the horizon and it was partly cloudy. 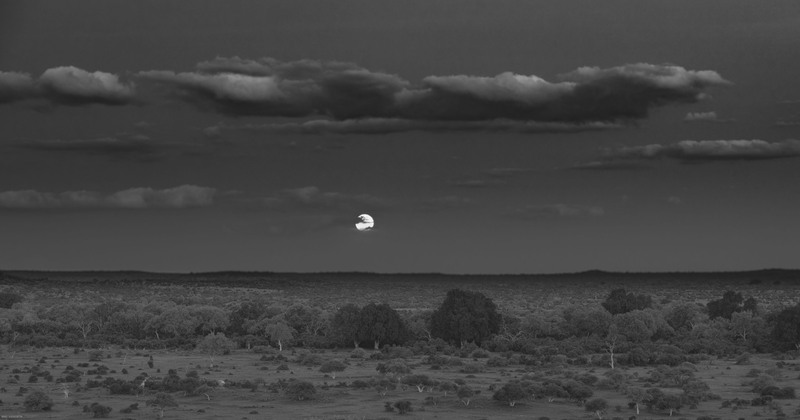 By taking the colour to black and white and darkening the scene, it gave a sense of being out in the bush on a bright moonlit night. Not implausible, the moon is so bright at full moon that it cast shadows on the ground. This matriarch was coming out of a croton grove in Mashatu in Botswana. It was early morning so the shadows in the vegetation behind her were dark. 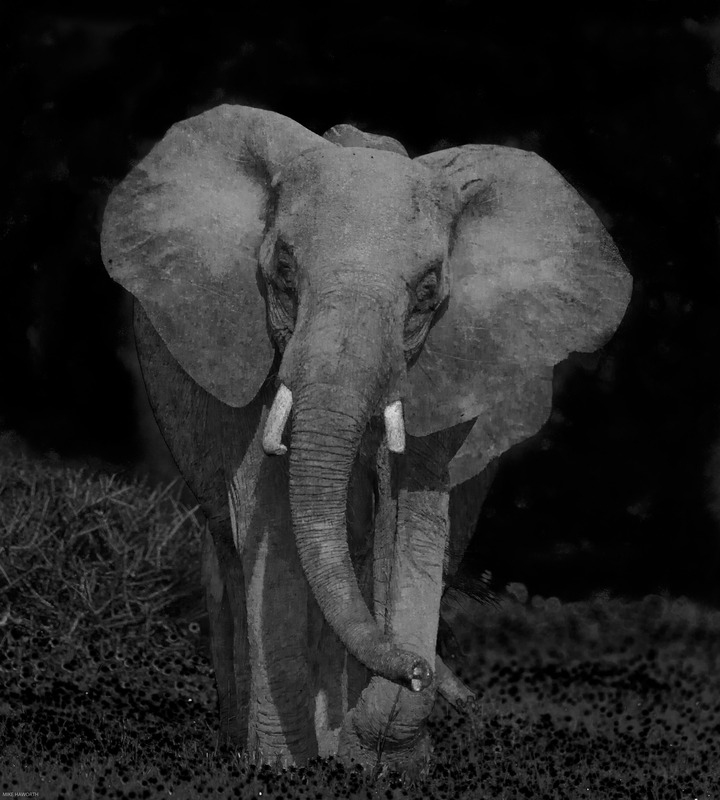 I thought darkening the background further gave this female elephant a more imposing approach. No disguising the bright morning sunlight in a bed of yellow devil thorn flowers in high summer. 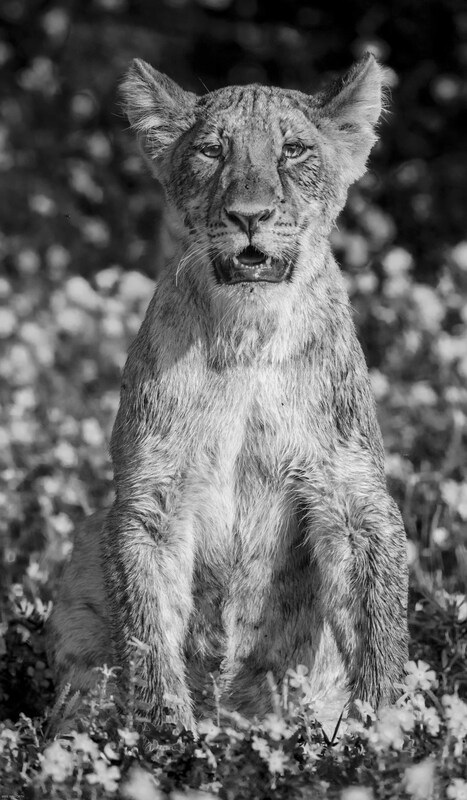 This lioness had cubs behind her and was watching a family group of giraffe ahead. The background, although beautiful, was of little consequence to her, as her attention was drawn elsewhere. 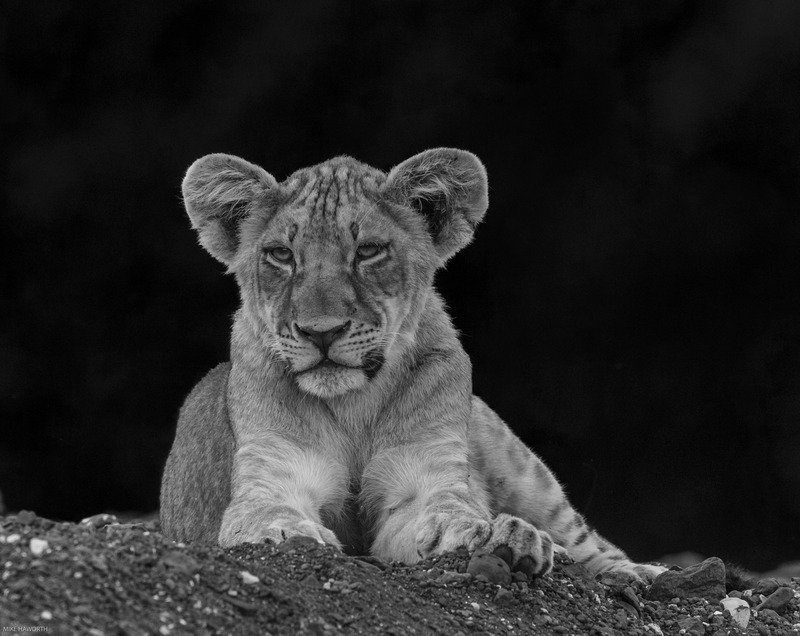 This cub was watching its mother intently. It was wet from the heavy morning dew and every now and then turned to look and see what we were doing. The sun was in the right direction, it was just about waiting for the cub to turn towards us – timing is all. One snoozy cub lying on the cool stoney sandbank of a riverbed at around 9h00 with a dark Croton forest in the background. 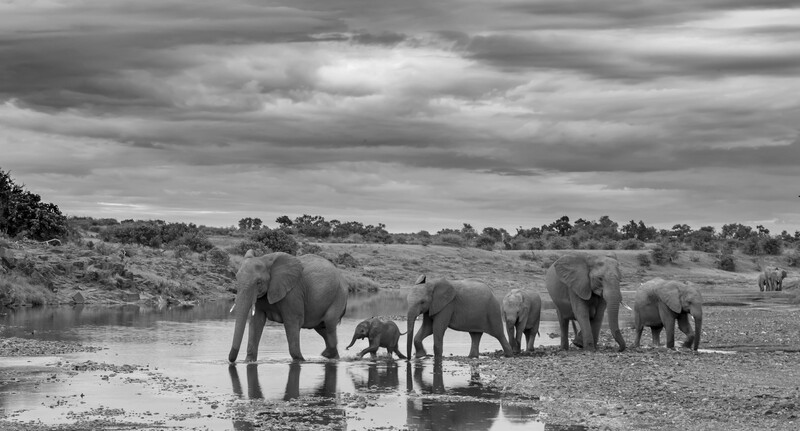 Along the Majale river in Mashatu, a few family groups of elephant had come down to drink. It was cloudy but not hot that morning. In black and white, the cloudy sky provides a wonderfully moody backdrop. 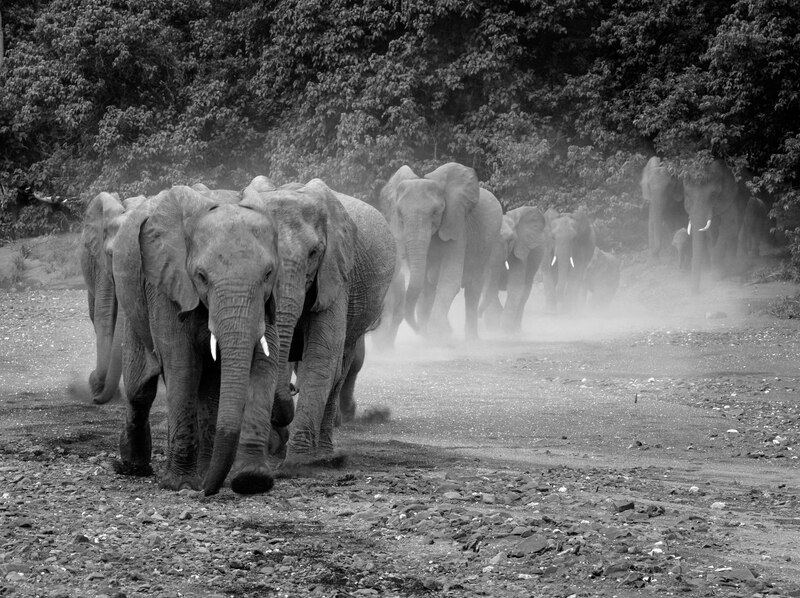 On another occasion, also in the Majale river, this herd of elephant came rushing out of the Jackalberry and Croton tree line on the river bank. Something must have spooked them. They did not take any notice of us and just rushed past. The dust stirred up by their feet was more apparent in black and white. 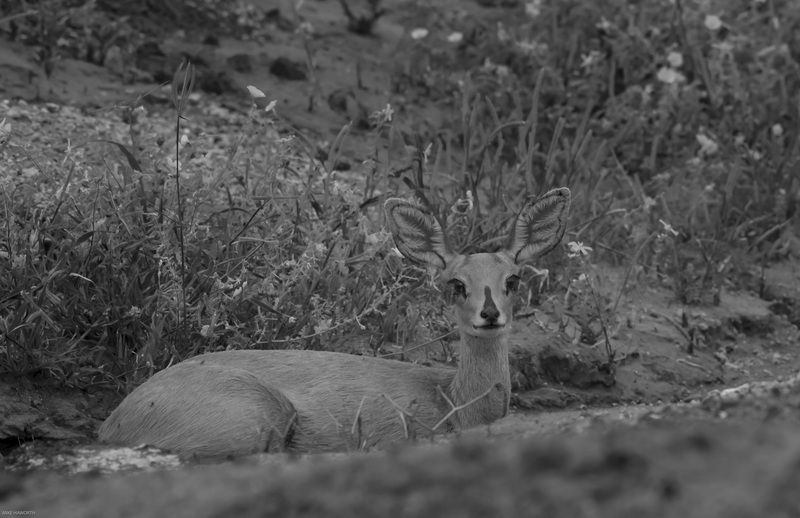 This Steenbok female (no horns) was lying in an eroded sand gully. She was very well camouflaged. Only by taking the colour out of the scene could you see her more clearly. There is no question that colouration plays a key role in camouflage. This is why the armed forces in the second world war used people who were colour-blind to fly in spotter aircraft to be able to see enemy armaments under the camouflage nets. 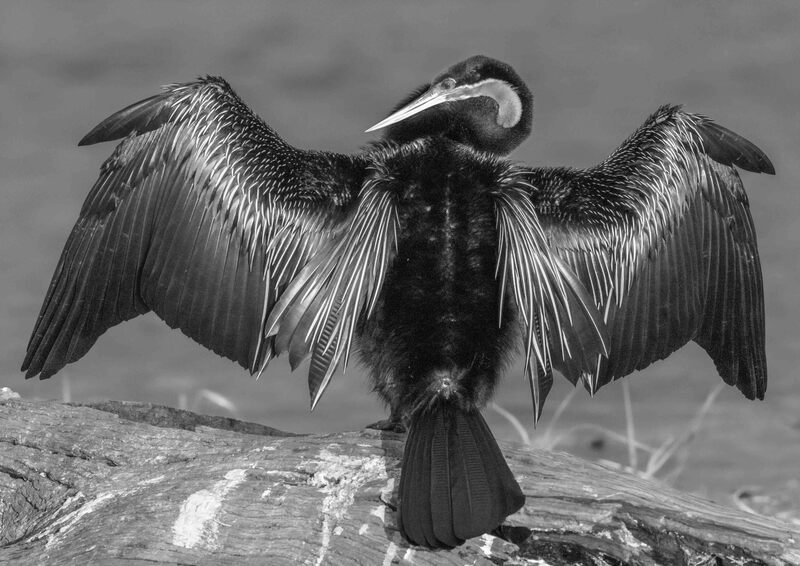 A Darter, the snake bird, so called because of its long flexible neck, sunning itself and drying its wings in the late afternoon sun on the Chobe river in northern Botswana. The golden sheen on its wings added to the contrast. 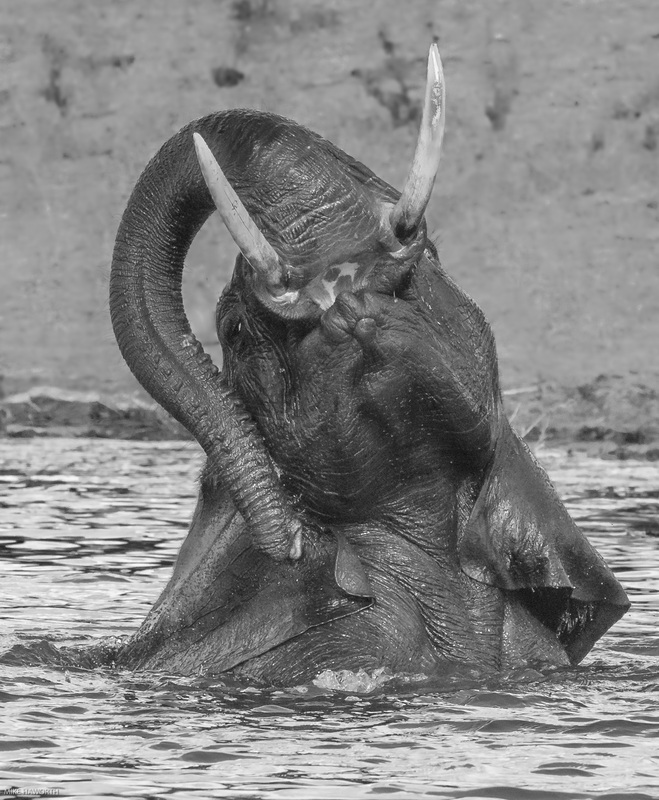 This elephant was having such fun splashing around in the Chobe river. You seldom ever see the mouth of an elephant from below its trunk. Those canines are a remarkable evolutionary adaption. 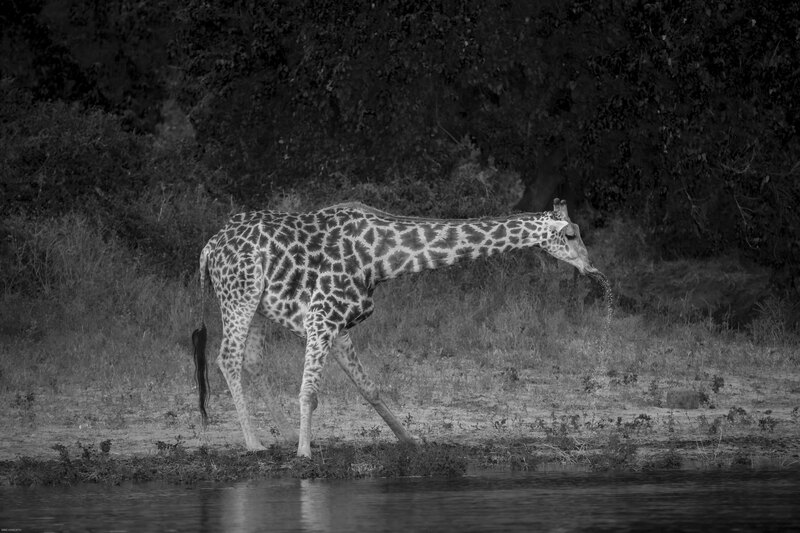 This giraffe was drinking from the Chobe river in the late afternoon, which is why its was well illuminated. There was thick vegetation behind it which enabled me to darken the background. It is unusual for a giraffe to drink at the river with such thick ambush potential right behind it. 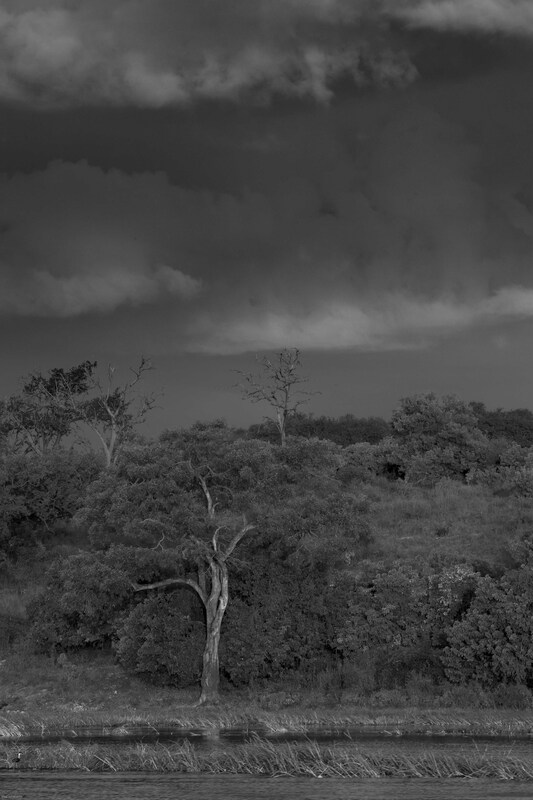 In April along the Chobe, the weather was variable with storm clouds brewing on a few afternoons. There is something very special about an African thunderstorm. The late afternoon light illumes the river while the sky grows dark and threatening, giving a sense of an impending unleashing of African wildness. The cumulonimbus clouds get heavy with moisture, generating massive upthrusts of air rising well over 5000 foot into the sky. The colours in the sky vary from blues and whites to dark grey, then out of nowhere, Zeus sends down a huge bolt of lightning followed by an almighty clap of thunder. You can measure how far the storm is away from the number of seconds between the lighting bolt and the thunder-clap, which is approximately equal to the distance away – one second equals one kilometre. 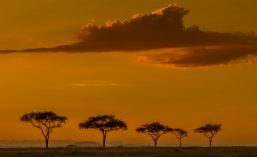 The full moon in April is impala rutting time. 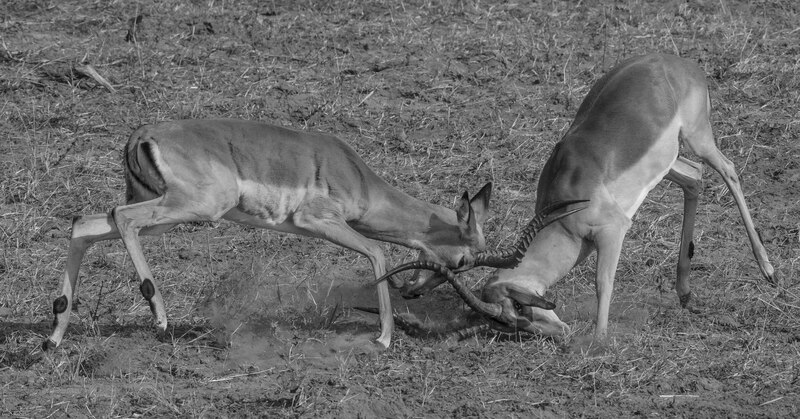 I was quite surprised how well-defined these two sparring impala rams were against the background. 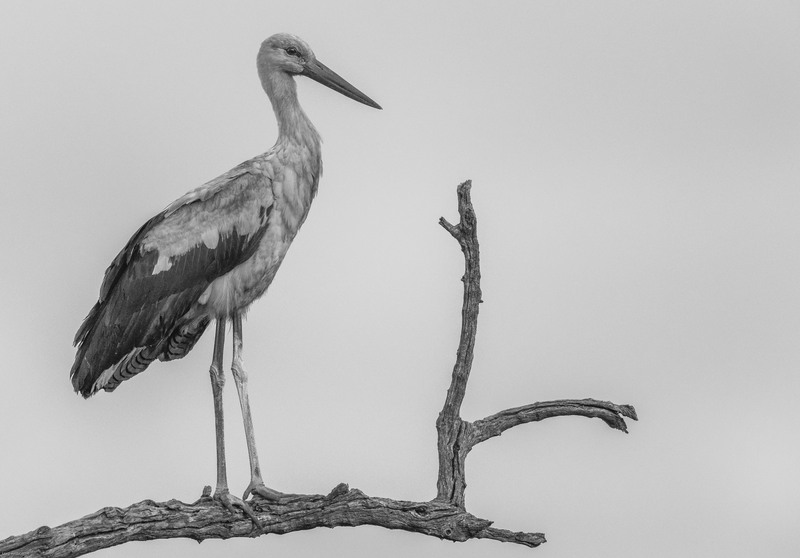 The black and white treatment showed off their form and texture against a very different textured background. 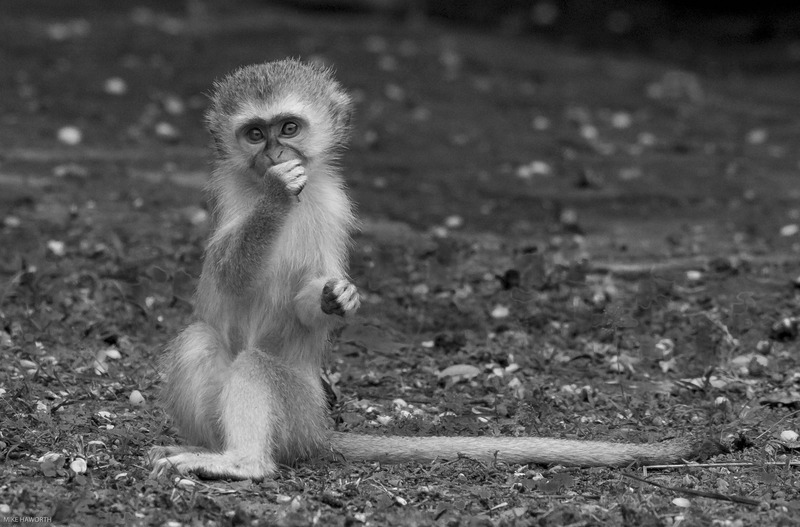 This very young Vervet Monkey was part of a troop which had been trying to find/steal food from the lodge dining room next to the Chobe river. This little imp was empty-handed so had to make do with the fruit from the tree above. 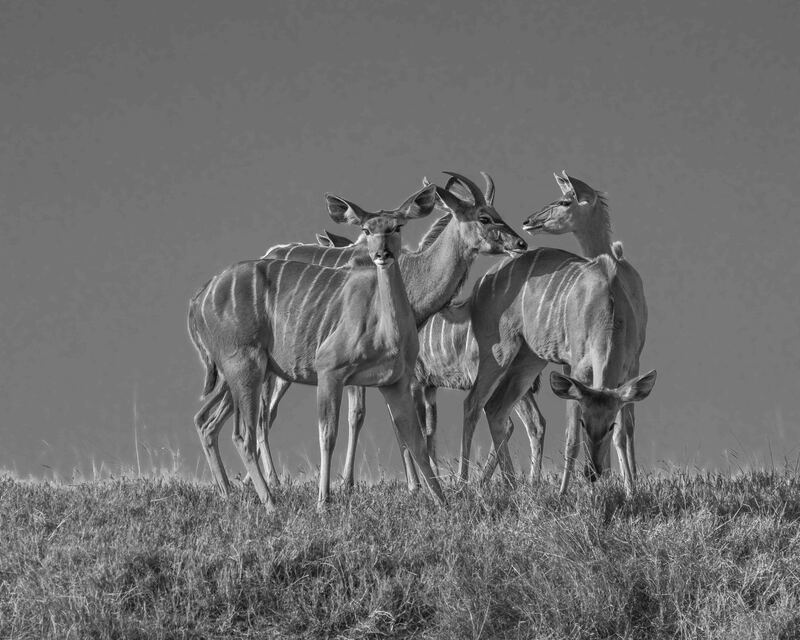 A family of Kudu standing on top of the Shilthave dam wall in Kruger Park. The elevation of the dam wall gives them a good visual on the surrounding area. The wind was blowing which always makes them nervous. The wind mixes up the smell and sound and makes it difficult for them to get a sense of any animals in the surrounding area. 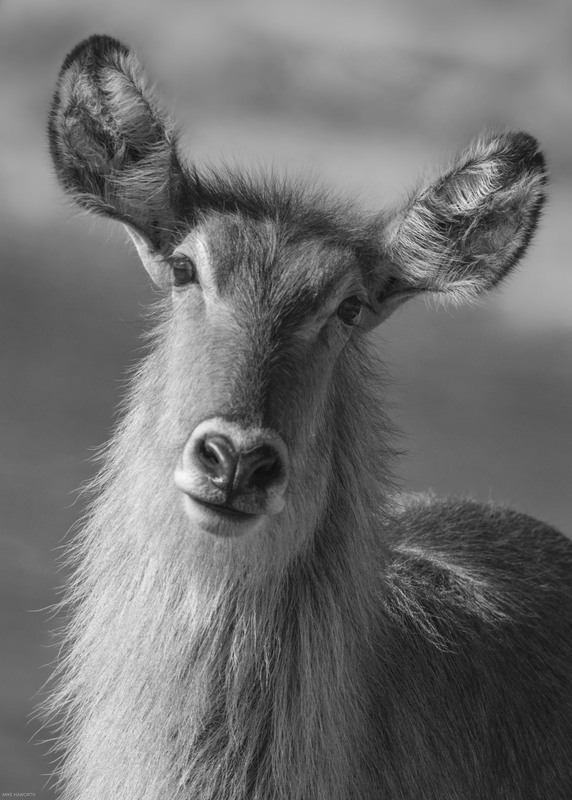 This was a very pretty, somewhat coy but engaging young waterbuck doe. 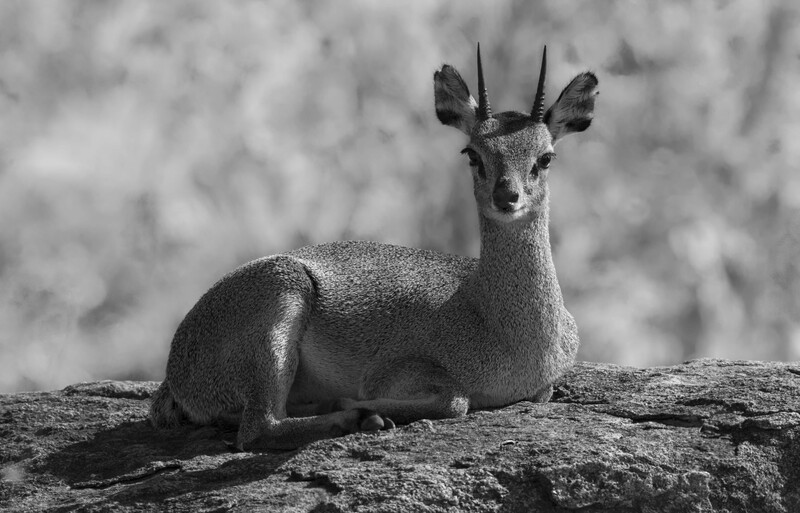 Almost a silhouette, this male Klipspringer was sitting on top of a granite boulder at the foot of a kopje along the Waterbuck road in south-western section of Kruger Park. I liked the different tones and textures. The dark side of the bush. Whether in colour or black and white you do not want to come across an “old dagga boy” like this in the bush on foot. 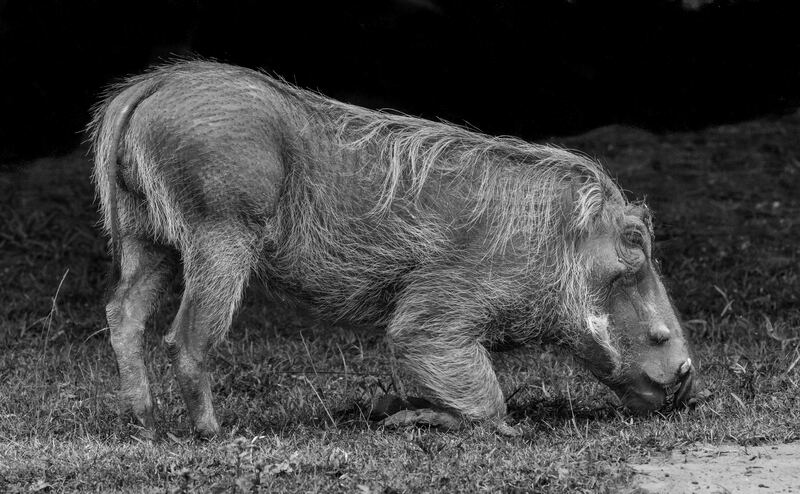 A “dagga boy” is an old buffalo bull which has been kicked out of the herd. Sometimes you find them on their own and they can be unpredictable and very dangerous. His textured boss is what does the work. 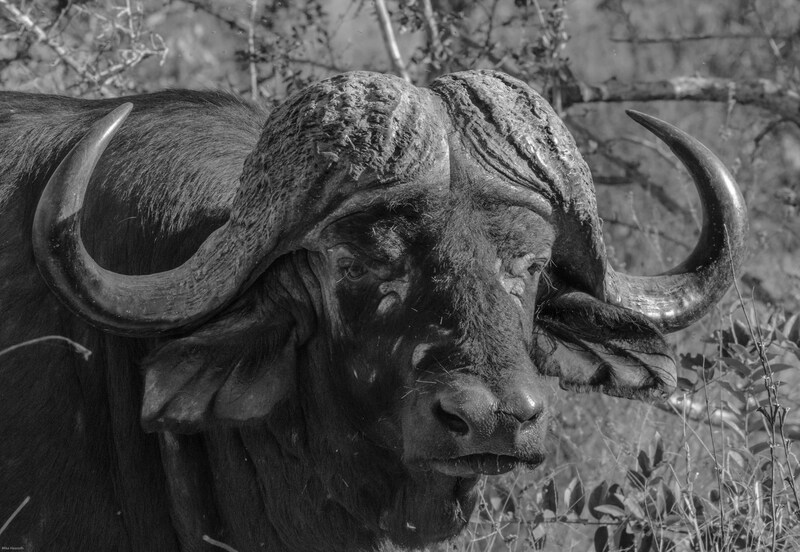 A buffalo bull can easily pick up an adult lion with those grappling hooks and throw it high into the air and cause real damage.